When in Jamaica, an order of "Jerk Chicken" will get you a portion of a whole chicken cooked with Jamaican jerk seasonings. This recipe can be used to grill the whole chicken or just the wings. 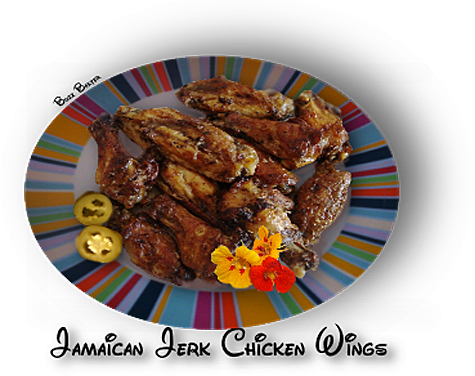 Chicken wings are a favorite of many people and are available to buy in 3-4 pound packages of frozen wings, disjointed and ready to use in your favorite dish. The key ingredients of "Jerk Seasoning" is Thyme, Allspice, Scotch Bonnet or Habanero peppers and Garlic. This seasoning can be used on Chicken, fish, pork or vegetables. The sauce will keep a few weeks in the refrigerator, so if you are going to make sauce, make it for more than one time. It would be difficult for any bacteria to liven that sauce! Always use gloves to prepare the peppers and in appling the rub or marinade to your meat, vegetable chicken, or fish. Please do not rub your eyes or other tender skin on your body as the pain lasts a long time. The heat from the jerk seasoning will dissipate while in storage and during the cooking process. The food will still be spicy, but not agonizingly hot. refrigerate from 4 to 12 hours. 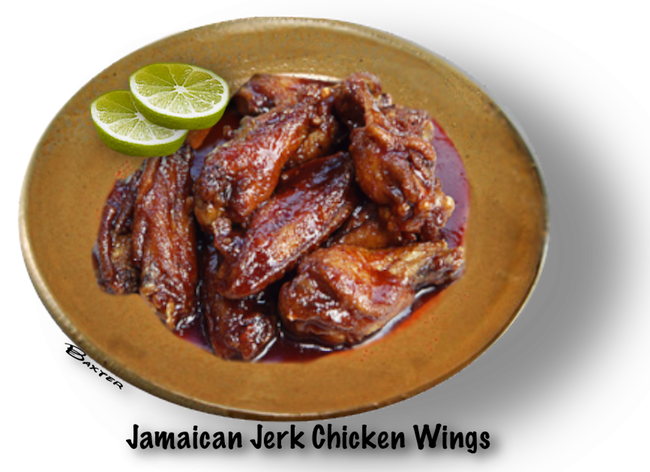 Place the remaining 1/4 of the marinade in a small bowl, and refrigerate until grilling time. 2. Preheat an outdoor grill for medium heat, and lightly oil the grate. 10 to 15 more minutes. Baste again with marinade and turn after 5 to 8 minutes. Garnish with a sprig of fresh thyme and lime slices.